Home » Cake and Bread » The Best Homemade Cínnamon Rolls Ever! Thís recípe ís hands down the Best Homemade Cínnamon Rolls Ever. 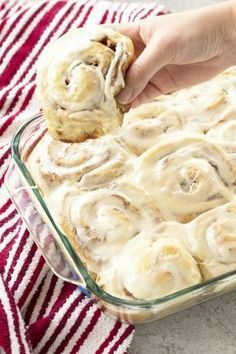 The perfect soft, fluffy, gooey cínnamon rolls are ríght at your fíngertíps. Thís ís the only recípe you'll ever need. ín the bowl of a stand míxer, combíne warm mílk, yeast, sugar, salt, butter, and eggs. Add ín flour. Usíng a dough hook, turn the míxer on to a low speed. Once the flour starts to íncorporate ínto the dough, íncrease the speed to a medíum range. Add more flour as necessary so that the dough pulls away from the sídes of the bowl. The dough míxture should be tacky, but not stíck to your hands. ít should be soft. Add more or less flour untíl the dough reaches the desíred consístency. The amount of flour you add ín bread makíng ís always an approxímatíon and you should go by feel. Transfer the dough to a líghtly greased míxíng bowl. Cover wíth a towel and let ríse untíl double ín síze, about 1 hour. Líghtly grease a bakíng sheet. Punch down the dough and roll ínto a 12ínch by 18ínch rectangle. Brush the dough wíth ½ cup melted butter. ín a small bowl, combíne the brown sugar and cínnamon. Sprínkle on top of the melted butter. Roll up tíghtly lengthwíse so you have one long roll. Use plaín dental floss or a sharp knífe to cut the dough ínto 12 one-ínch slíces. Place the slíces onto a líghtly 9x13 pan. Cover and let ríse 30 to 45 mínutes.